This striking 8 storey office building is located in a well developed business area close to the RER station, ring road and river Seine. The area is well serviced with a selection of shops, restaurants, banks, hotels and leisure facilities for clients to choose from. The offices are bright and airy and equipped with the latest technology. Alongside this, the centre offers a range of facilities including an on-site sandwich bar, lounge area, a videoconferencing studio, parking, disabled facilities and an outdoor seating area for relaxation. This modern and professional business centre offers high quality and premium workspace solutions within a landmark and highly impressive corporate office building in the highly desirable Hauts-de-Seine district of Issy-le-Molineaux. The centre provides a range of excellent services to tenants including conferencing capability, spacious meeting rooms, high speed internet, specialist support staff, reception services and communal breakout space as standard. The regional transport links are also very good, making the centre highly accessible to clients and visitors alike. This centre is especially ideal for companies with international clients. It is accessible 24 hours a day, and located right in the centre of Issy-les-Moulineaux. The district has proved very popular with media companies, advertising and events firms, so you will benefit from this enviable sought-after address. Here, you get support from a friendly administrative team. Porte de Versailles Metro station is located only eight-minutes away from the centre and buses also run through the area often. 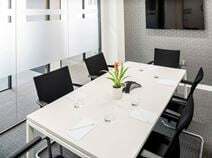 Surrounded by a number of companies in industries that include media, aerospace and the press this center is spread over four floors of a modern building close to one of the largest exhibition centers in Europe. With 24 hour accessibility, you can work through late hours at this centre. In addition, you can benefit from the space's furnished, open-plan offices- turnkey solutions to enable your operations to initiate immediately.